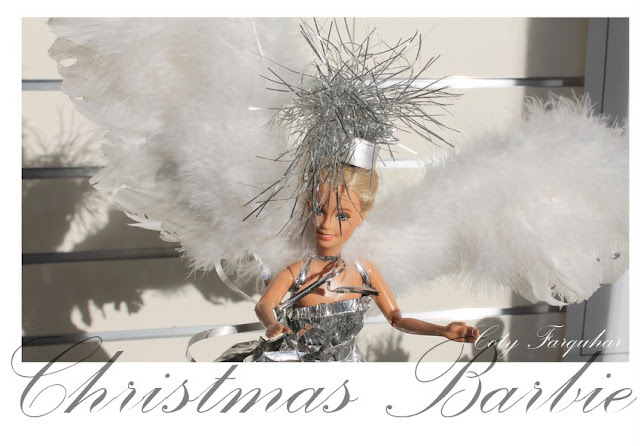 Styling Magazine by Coty Farquhar - Australia: Celebrating the Season of Christmas with Two boys and One Hundred Barbie dolls and a 100 metres of Tinsel. 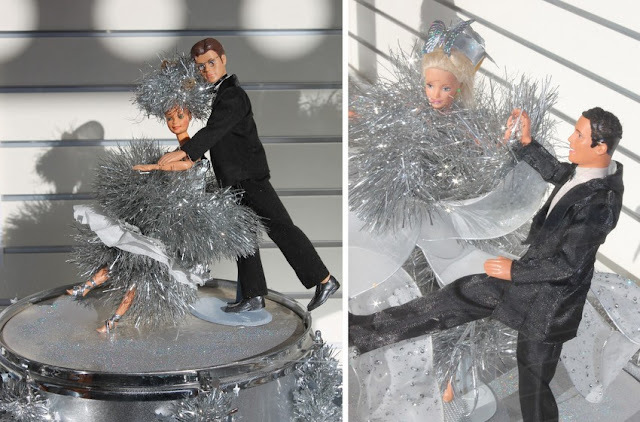 Celebrating the Season of Christmas with Two boys and One Hundred Barbie dolls and a 100 metres of Tinsel. quite the contrary, I love Barbie! She is the most famous and fashionable 53 year old girl in the world! I was asked earlier this year by a store in Bowral if I could do their Christmas Window this year. A Christmas window for the children and a window to thank their customers. I recently bought from a doll collector about two hundred Barbie dolls, every stylist needs a Barbie or two ...... or two hundred, right? They came as a job lot. and like Toy Story, they just couldn't separate them. So ... there it was, there was my theme, two boys, 100 girls, some silver drums and a touch bling for a Christmas Window in the heart of Bowral! Angels with wings and have them dancing and celebrating the Season of Christmas. are Pete and Bhish (Ken and Ken). and both very well known in the town of Bowral. The girls, (Barbie) well they have the most beautiful girls working for them. 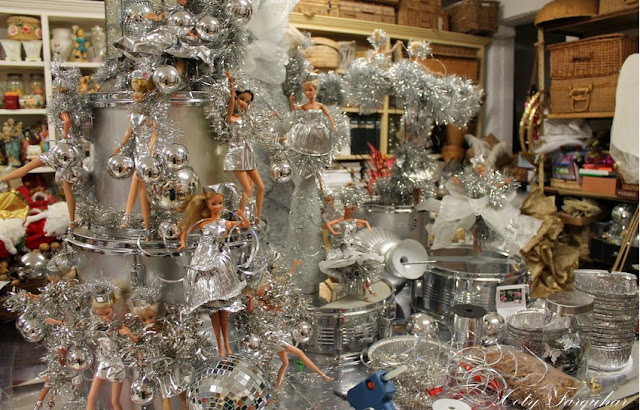 In my workshop last week (above) dressing the girls in little silver and white dresses, lots of tinsel, little pill box hats, tiny shoes and a lot of bling! Below: The long front window at Guardian Pharmacy, Springett's Arcade, Bong Bong Street, Bowral. Love it Coty, what fun! How very creative and clever you are! The Christmas windows were a lot of work, but especially rewarding - in fact I miss this side of retail. So your post brought back some happy memories for me - thank you!